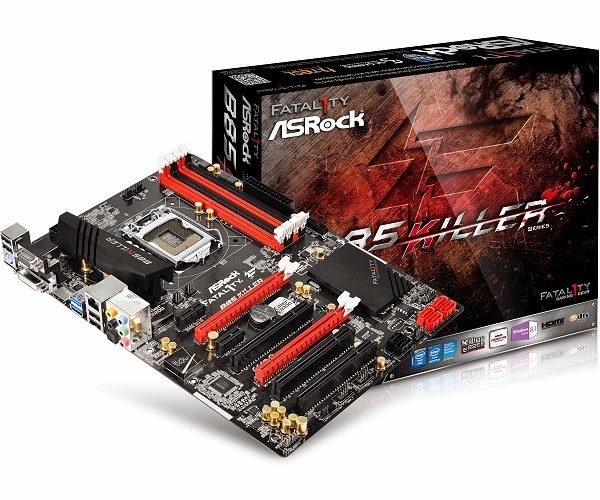 TAIPEI, Taiwan, December 4, 2013 – Christmas is right around the corner, and ASRock is ready to celebrate the upcoming merry holidays with new designed Killer Series motherboards! Standing next in line to the former ASRock Fatal1ty Z87 Killer is yet another serious gaming motherboard, which is equipped with Killer E2200 Series LAN, Gaming Armor, Key Master and XSplit, but this time it adopts an Intel B85 chipset – ASRock Fatal1ty B85 Killer! Killer LAN: No LAG, just FRAG! If you once were or currently still are a proud online gamer, then you must understand how tormenting it is to lose due to LAG or how disgraceful it is to blame one’s loss on LAG. Now with Killer LAN you won’t have to succumb to crappy internet connections anymore! Killer LAN is efficient in improving UDP (User Datagram Protocol) based applications up to 5 times faster! Lab tests have proven that Killer LAN reduces the latency in games, for instance, the latency of League of Legends may be lowered by 136%, Diablo 3 lowered by 60% and DOTA2 by 47%*! Besides gaming, users can also prioritize other application’s internet speed with the Killer Network Manager utility. Heavily equipped not just for gaming, but for winning! ASRock Fatal1ty B85 Killer is coated in the same red and black color scheme just as other ASRock gaming motherboards to represent intense and fierce gaming. Other than the Killer E2200 Series LAN, it also boasts Gaming Armor for extra performance and stability, which includes Hi-Density Power Connectors for the CPU power, 15μ Gold Fingers for the PCIe slot. Purity Sound™ 115dB SNR to provide immersive audio effects for entertainment, Key Master with both Sniper Key and Macro Key to turn your ordinary keyboard and mouse into lethal weapons! Plus a free bundle of XSplit 3 month premium for free which is worth $24.95, so that you may broadcast your exciting gaming moments online with the rest of the world! And of course, gold capacitors for extending the motherboards lifespan up to 2.5 times longer, Digi Power for providing smoother power for the CPU Vcore, Triple Monitor technology by HDMI, DVI-D and D-Sub ports on the rear I/O. All in all, what could you possibly ask for more for an awesome gaming motherboard that is destined to help you win?